FOREX: The US dollar index is higher by 0.63% on Friday, extending the significant gains it posted in the previous session and touching a new 13-month high. The euro and the pound are the main underperformers, both posting fresh multi-month lows against the greenback. The yen, meanwhile, remains firm amid risk-off tones. In EM, dollar/lira briefly broke above the 6.000 handle, with the pair being up by nearly 7.0% earlier in the session, before pulling back a little. STOCKS: Wall Street closed lower for the most part on Thursday. The Dow Jones (-0.29%) and S&P 500 (-0.14%) posted modest losses, while the Nasdaq Composite (+0.04%) edged marginally higher. Futures tracking the S&P, Dow, and Nasdaq 100 are all pointing to a lower open today. 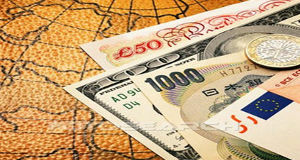 The negative sentiment spilled over into Asia on Friday, with most indices being in the red. In Japan, the Nikkei 225 and Topix declined by 1.33% and 1.15% respectively, as a stronger yen clouded the outlook for Japanese exporters. In Hong Kong, the Hang Seng dropped by 0.89%. Europe was a similar story, with futures tracking the major indices all flashing red, pointing to a significantly lower open today amid worries European banks may be exposed to Turkish contagion risk. COMMODITIES: Oil prices traded lower, with WTI and Brent crude being down by 0.44% and 0.67% respectively on Friday, as a strengthening dollar took the wind out of the dollar-denominated liquid’s sails. Oil continued to move lower even despite news that China will remove crude oil from the list of US products it will impose tariffs on. In precious metals, gold prices are down by nearly 0.4% today, currently hovering above the $1207/troy ounce level. Since gold is also denominated in dollars, a strengthening greenback renders the yellow metal less attractive for investors using foreign currencies. That said, considering how much the dollar has soared since yesterday, gold has been holding up relatively well, admittedly, with the area around $1200 providing notable support. The US dollar advanced across the board on Thursday, and is building on those gains in Friday’s session as well. The dollar index is up by 0.63%, touching a fresh 13-month high. The greenback’s strength appears to be owed to a combination of euro and sterling weakness, as well as some relatively hawkish comments from one of the Fed’s arch-doves. Chicago Fed President Charles Evans said that the central bank may need to raise rates into “restrictive” territory. Coming from a policymaker who is typically ultra cautious on policy – having dissented a rate increase in December –, investors likely interpreted his remarks as increasing the likelihood for rates to move higher than what is currently implied by market pricing over the next years. In the euro area, the single currency retreated against all its major peers, with its underperformance being attributed to reports the ECB is concerned about the exposure of European banks to Turkey. Specifically, policymakers are worried Turkish borrowers may default on foreign-currency loans as the lira continues to collapse, which may spill over into the Eurozone. From the market’s perspective, this was likely interpreted as another risk that could delay – or even derail – the ECB’s normalization efforts, hence sending the euro lower. Euro/dollar posted a new 13-month low of 1.1430. Sterling, meanwhile, got a brief reprieve yesterday after media reports suggested the EU may provide some Brexit concessions, allowing the UK to remain in the single market for goods. The currency’s rebound was short-lived, though, as it quickly gave back its gains to record new multi-month lows against both the dollar and yen. The yen held its own in the midst of this, remaining stable against the soaring dollar, but gaining against practically all its other major counterparts. Given the absence of news out of Japan, its gains appear to be a function of safe-haven demand, as trade woes continue to lurk in the background and whispers of contagion risk from Turkey are gaining traction. On the subject of Turkey, the lira’s freefall accelerated on Friday, touching yet another record low. Dollar/lira briefly broke above the psychological 6.000 level. The “straw that broke the camel’s back” appears to have been the lack of progress in US-Turkey relations after a meeting in Washington. Economically, inflation is soaring, and a plunging currency will likely exacerbate that further, especially given Turkey’s dependency on imports. Market chatter suggests the prospect of capital controls to stem the lira’s decline is very much on the table. While fears of a no-deal Brexit continue to pressure the pound, a mixture of UK data is expected to bring fresh volatility to the currency, with investors waiting eagerly to see whether this could be a chance for the pound to recover steep losses. Among the data, preliminary GDP growth figures for the second quarter will attract the most of interest as forecasts suggest that the British economy has picked up speed in the three months to June. According to analysts, GDP has grown by 1.3% year-on-year (y/y), slightly faster than in the first quarter when the expansion was finalized at 1.2%. On a quarterly basis, the measure is also expected to have improved, with analysts estimating a growth of 0.4% compared to 0.2% seen previously. 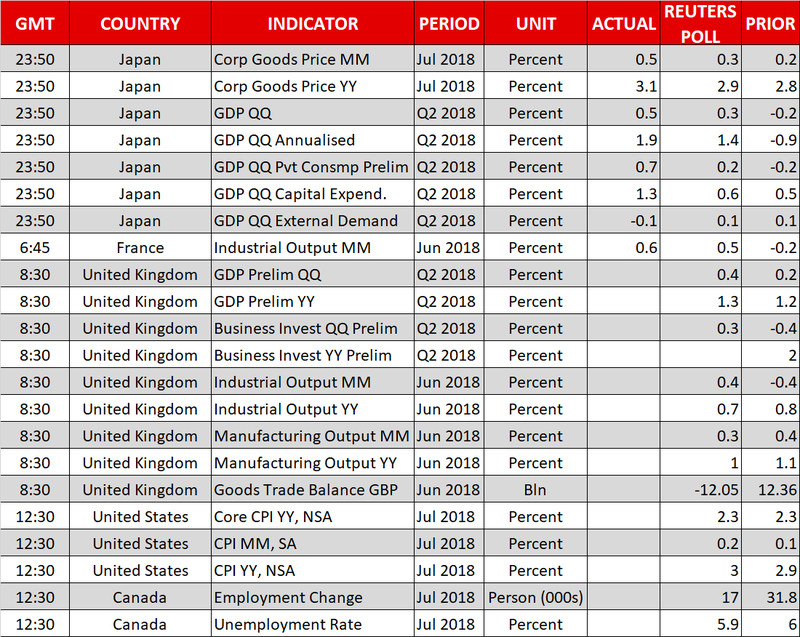 At the same time, industrial production and trade figures out of the UK will be hitting the markets as well, giving a piece of evidence on whether Brexit uncertainties and US’s trade protectionism have weighed on business activities. For the month of June, growth in overall production is anticipated to ease slightly to 0.7% from 0.8% in May, while separately in the manufacturing sector, the output is also said to have narrowed, slowing down from 1.1% to 1.0% y/y. Regarding the exchange of goods with overseas countries, the UK’s trade deficit is projected to decline by $0.31 billion to $12.05bn. Should the figures surprise to the upside – especially on the GDP growth front – the pound could reverse south. Still, the loose confidence on how the Brexit story could progress before October’s crucial Brexit deal deadline and the Bank of England’s limited and gradual approach for future rate hikes could limit any positive data impact on the pound. Meanwhile in the US, July’s consumers prices (1230 GMT) could enhance investors optimism on the US economy even further later in the day as analysts believe that the CPI has inched up from 2.9% y/y to 3.0%, rising for the fifth consecutive month to levels seen for the first time since January 2012. Excluding volatile items, however, the core measure is projected to stay unchanged at 2.3% y/y. While CPI figures are not the Fed’s favorite inflation measure, the gauge is still closely monitored by policymakers and any improvement in the numbers could signal that the US is in a better inflation trend. Therefore, in the wake of stronger CPI prints, the dollar could move higher on speculation that the Fed’s preferred PCE inflation measure could increase positive momentum as well, increasing the odds for two additional rate hikes this year. 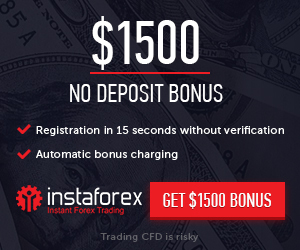 In neighboring Canada, loonie traders will be eyeing July’s employment report which is expected to show that the number of employees has increased by 17k, almost half the 31.8k rise seen in June. But the unemployment rate could bring some smiles to BoC policymakers faces as this is anticipated to pull back to 5.9% after reaching 6.0%, the highest rate observed since October. In oil markets, Baker Hughes is scheduled to report on US active rigs for oil drilling at 1700 GMT. Developments in US-Russian relations could attract some interest during the day after Russia threatened to retaliate to Trump’s plans for new sanctions against Moscow aimed to punish the country for the chemical attack on a former Russian spy in Britain. Tensions between Turkey and the US have escalated as well, as talks over the detention of a US pastor in Washington between a Turkish delegate and US officials failed to break the ice. 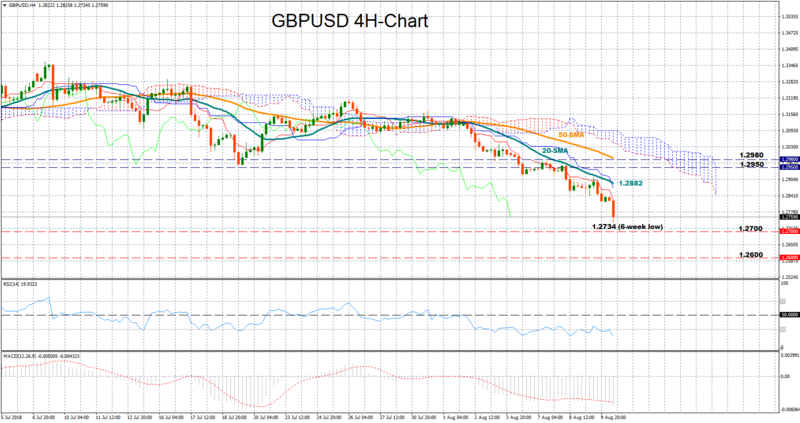 GBPUSD has lost 1.8% so far this week and is set to finalize the week around six-week lows (1.2734). While the downward pattern could remain in place in the short-term as the price continues to trade below its 20-period moving average and the Ichimoku cloud, the RSI suggests that a rebound is not unlikely as the index has expanded well into the oversold territory (below 30). Still, the MACD, which keeps moving in the negative zone, supports that downside pressures could dominate. Should the UK’s GDP growth increase faster than expected, the price could bounce up to find resistance at the 20-period MA currently at 1.2882 as it did in the previous week. Even higher, bulls could try to break the 1.2900 round level to test the area between 1.2950- 1.2980 where the price stopped in mid-July and early in August. On the other hand, further declines fueled by disappointing readings out of the UK, could push the pound down to the 1.2700 psychological level before attention turns to 1.2600.